Is there a better alternative to QuadEquations? Is QuadEquations really the best app in Mathematics category? Will QuadEquations work good on macOS 10.13.4? QuadEquations needs a rating. Be the first to rate this app and get the discussion started! 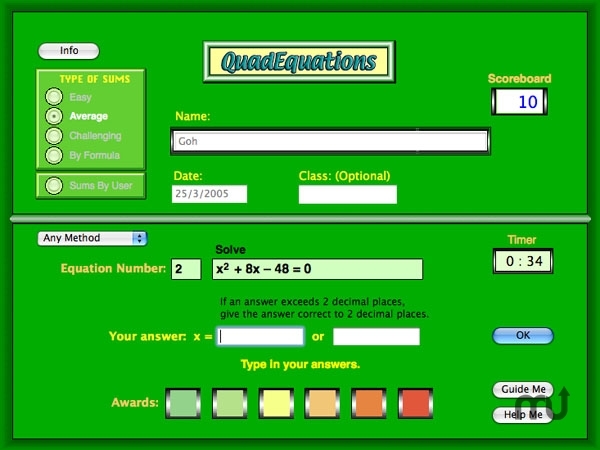 QuadEquations is software for teaching and learning of quadratic equations. It covers solutions by factorisation, "completing the square" and formula. Each method is clearly explained, with simple sums for practice. Can generate hundreds of sums (up to 200 sums per session) for drills. The type of sums is selectable. Step by step guide for beginners to ensure they get the correct answers. Students can key in their own sums and let the interactive guide help them do their homework. Marks automatically and can print a detailed report for each session. Two players may compete using one computer. Sums are marked automatically and a report can be printed after each session.